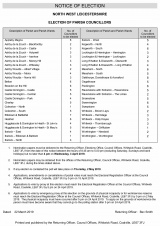 Castle Donington Parish Council provides YOUR local services. We endeavour to make Castle Donington a better place to live, work and visit. Our website includes a wealth of information about how we conduct business and what we do. Find local groups and businesses in our community directory. Use the search or browse the site to find whatever you are looking for. If you can't find what you want or would like to recommend any improvements to our website then please contact us. The Parish Council exists to ensure that, within the resources available, the parish, its environment and local services are maintained to the highest possible standards for citizens, visitors and those who work in Castle Donington. The Parish Council will also provide a focus for civic pride and community spirit, listen, identify and respond to agreed local needs and should help develop a strong, secure, self-reliant and self-confident community. The Parish Council office has now moved to the new Hub. Congratulations to all the staff at Keller Construction for a great job well done. The contract for the refurbishment of The Hub was awarded to Keller Construction Ltd an award winning construction company based in Ashby de la Zouch. The work is now in the final snagging stage. 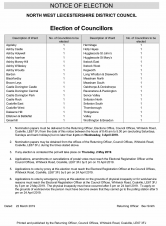 How do I contact a councillor? How do I find the agendas or minutes of Council Meetings? How does the Council spend my money? 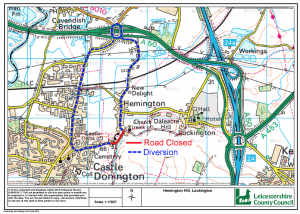 Hemington Hill, Lockington (see attached plan). The purpose of the TTRO is to allow Leicestershire County Council to facilitate carriageway patching. XHTML 1.0 validated. WCAG compliant. Page generated in 0.1324 seconds.